In with all the sorting and changing things around I realised I hadn’t yet heard from many of the sponsors of the Sewing Indie Month competition. I’d been told they’d be in touch, but I guess they’ve been as busy as me! So this week I sent out a round of emails and have recieved some goodies. The prize pack was pretty big & I’ve already allocated some goodies to a very good friend who loves to sew for herself & daughter. Today I have a giveaway of two patterns by a popular indie pattern company By Hand London. In other news, if you’re based in the West Midlands (UK) and would be interested in attending a seminar for sewing with stretch knits & lace, Fred Winter in Stratford on Avon is hosting Gill Arnold for a 2 hour talk on the 15th November. Gill is so very knowledgeable, and a very nice person too! You can choose from a morning or afternoon session where she’ll be giving advice and demonstrations on stretch knits & lace. The sessions are 10-12 for the morning and 1:30-3:30 for the afternoon and cost a mere £15 per person. You will have to pre-book because these sessions always sell out quickly and there are a limited amount of seats. Contact Caroline Winter on 01789 268 011 if you’re interested. (I’m not being paid for advertising this, I can highly recommend Gill after attending some of her workshops!! & Fred Winter is my local fabric store.) They also have a fabulous selection of Liberty fabrics, tana lawns now on sale at £16/m! I was good – very good, and didn’t buy any! Now I’m off to see how I can reorganise the vintage patterns to fit into those new boxes – oh, and I am about half way through making another Bellatrix for Daughter No2. She wanted a solid colour one and I found 1.5m of pale blue chino cotton from Croft Mill in the stash. This is the first Bellatrix in a long while where I haven’t had to cram the pattern pieces onto the fabric! I’m lining it with a blue floral cotton lawn, apart from the sleeves which are getting a white silk haboutai. Hopefully I’ll be showing that off after the weekend. I would love to sew the Elisalex pattern. I’ve been admiring the various versions of this dress in the sewing blogosphere. I’ve never made a tulip style skirt and I would love to give it a try. Even if the tulip skirt doesn’t work out (i.e. it may not be flattering), the bodice could work well with an a-line skirt or a straight skirt! I’ve been a little bit reluctant to try out the indie patterns because of cost and the fact that I have so many Big Four patterns but I’ve been admiring your creations, particularly the Bellatrix. So much so, that I purchased the Carme and the Bellatrix patterns a few weeks ago. Coming out of lurking to get a chance at the Anna dress. We have nasty, hot, long summers in Texas and I have found this year that maxi dresses are a great way to look nice and feel cooler when you are sweating buckets. Plus I have about 12 yards of rayon challis prints in my sewing stash that need to be used up. Thanks for a great giveaway. Oohhh. Such lovely patterns. I have the Anna pattern and I just love her. That is why I would love the Elisalex. I have a gorgeous brocade sitting in my stash begging to be made into this dress! Every year, my parents go on summer vacation to a small town in the middle of a region that is well-known for its long and varied history of textile production. They still weave awesome (and very expensive) jacquard linen there, for example, and they have classes for all kinds of interesting textile techniques and a big textiles market every year in summer—which are two of the main reasons my parents have been going there every July for a long time now. I started to sew about two years ago, so the past two summers, my parents brought home some fabrics for me from the region. Usually, those are neutral-coloured natural fabrics, because that’s what the manufacturers in the area specialise in. I have some great-quality grey linens for trousers for my boyfriend and myself in my stash from last year, for example. This year, my mum chose some medium-weight jacquard-woven pieces from a shop’s remnant bin for me, my dad got me a piece of silver-grey dress-weight linen with a jacquard pattern as well—and then, among all of the neutral-coloured linen pieces, there’s this … tablecloth. My mum got it for me because it also has a jacquard pattern, which she particularly loves herself, and it was really cheap, and she thought that it would be fun for pocket bags or stuff like that. Uhm, a whole big tablecloth for pocket bags? Does she think I want the same pocket bags in all of my clothes, until the end of time? In any case, she totally missed the potential of the fabric! It’s a completely over-the-top shiny silver fabric (of mystery composition, the label just says it’s “easy to care for”) with a jacquard pattern in a darker shade of shiny metallic grey, and, being jacquard, can be used with either side as the right side. (I can’t imagine either side being used as a tablecloth, however, which might be why it was so cheap.) Did I mention that it’s a lot of fabric? I was going to make a crazy disco jumpsuit from it, but now that I’m reminded of the Elisalex pattern (yes, we’re finally getting to the point), I think that that is clearly its destiny! I’m always a little sad when I see someone make an Elisalex with some random skirt from another pattern. Ladies, the skirt is the whole point of the Elisalex! And now please imagine it in a shiny silver fabric with a jacquard pattern! You’ll have to admit that that would be awesome (and crazy and completely over-the-top, but in an awesome way—I hope)! Thanks for the fun giveaway! I really like that you are not just choosing someone at random. It’s a lovely idea to make people think about what they would actually do with the pattern instead of just having everyone say “yes, please, pick me”. thanks for arranging this giveaway! I definitely need the Anna pattern. And I’m surprised that there is even competition for this pattern, since I am absolutely certain that I am the only person with a sewing machine on the planet who has not sewn it up! I’ve lusted after this pattern even since I saw Foxgloves and Thimbles rock that dress (http://foxglovesandthimbles.blogspot.com/2014/06/bhl-anna-dressed-to-nines.html) and make me go va-va-voom! I thought she should be singing on a piano with a single spotlight on her. I like how it complements the curvy figure, because not all patterns do. Its versatility has been demonstrated by the creative bloggers, and Dolly Clackett has hacked that bodice into whole new dresses. I live in America so the whole reason I haven’t bought it was the shipping and the one time I tried to buy it from Sweet Little Chickadee since I was placing another order it was sold out. So I’ve just been stalking it from across the pond. If I win I plan to hack it six ways to Sunday (and I’m dying to try it with knits!). I’d have to go with the Elisalex pattern. I don’t actually have any good long-sleeved dresses, so I’d love to sew myself one. Hello! I think it’s really generous to be giving these patterns away and I’d love to make the Anna dress, so here is my comment to give winning a go. I’ve been sewing for about 6 months and was really chuffed to be able to wear some hand made garments last week on a holiday to Croatia. The weather was gorgeous until we flew back. The torrential rain started, our flight was delayed and our bags were left on the tarmac waiting to be loaded onto the plane. I thought what harm can a little water do? I found out when I picked up my bag in London. Unfortunately, everything got so wet some colours had run leaving all by clothes with a very bad tie-dye effect! It’s a shame I can’t wear some of them now, but it does mean I get the chance to sew something new and it would be great to add the Anna dress to this. I would love to have the Elisalex dress pattern. I need a dress that will flatters my apple shaped body. I love wearing wool dresses in the autumn and winter. I would love to try the Anna dress because it is an Indie pattern! Can you believe that I only have one Indie pattern in my stash and that is a crying shame! Shame on me!! I have seen Oona’s and love them! And we all know that Oona knows a good thing! 🙂 Thanks for the giveaway! I would like to try the Anna dress, because I have become scared of making dresses; my body shape has changed and I’ve gained weight, and I no longer have an instinctive knowledge of what looks good on me. I would like to give this dress a try, to get back into dress making, and hopefully try a new to me style that may work. Thanks for the chance! What a fun give-away. 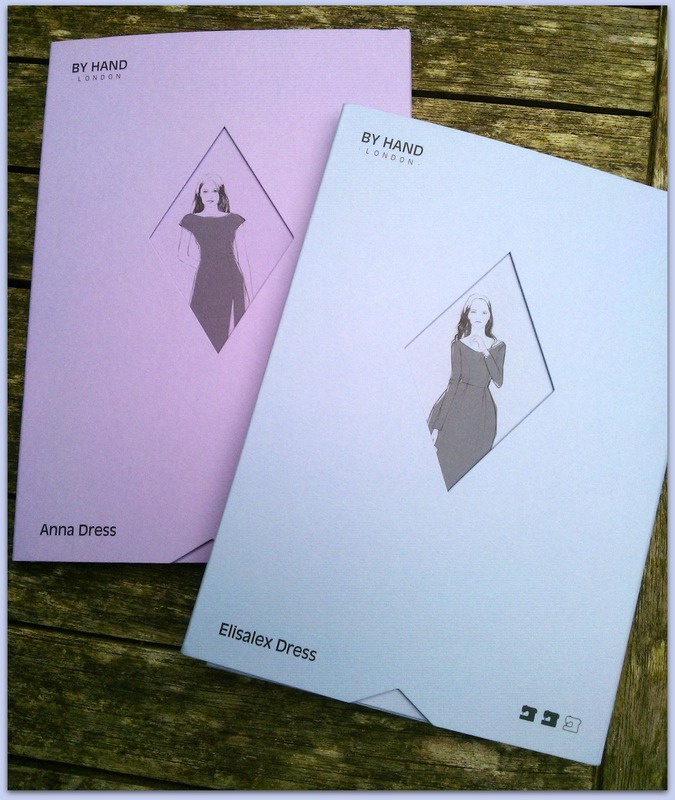 If I should choose between these two patterns it must surely be the Anna dress. I’ve seen makes from this pattern in many variations around the web, and what they all have in common is that they look gorgeouse. On tall and short woman, on full busted woman and on almost flat chested woman (like me). I have never tried out a pattern by By Hand London and I really want to do so. I love the idea of Indy pattern makes and have set my self the goal to try out as many of the indy patterns I possibly can (I have only been sewing clothes for my self since january). So far I have tried out two different Sewaholic patterns and three different Colette patterns. I love the idea of supporting the different strong independent people out there that have worked their guts off in order to produce these patterns. I have also gotten my husband involved in helping me set up my own blog, and pretty soon I will start blogging about my indy adventure. How cool would it not be if Anna was the first pattern I blogged. Elisalex! Yes please, and thank you! And good news! I’ve coveted this pattern for so long that I can substantiate why I need it, LOL. At first lingering glance, it was the box pleated tulip skirt that made me a little giddy. It’s a departure from my fit and flare dresses,and we all need variety in our lives,right? But! It’s really the sleeves that steal the show for me. None of my current go-to patterns offer a long sleeve version, and the Elisalex looks fabulous with sleeves. Sure, I could lengthen the sleeves on one of my TNT patterns, but I don’t think the finished dress would look right at all. The lovely Elisalex is actually designed to look fabulous with long sleeves!!! Need I say more! I would love the Anna dress. It looks like a dress I´ve been dreaming of for a long time. It´s classic and modern at the same time. I love it! The Anna dress is the pattern that inspired me to get out my sewing machine and have a go at making my own clothes. I’m still very much a beginner, but that vision in my mind of a navy blue Anna maxi dress for this year’s Christmas party just won’t leave me mind. Oh, it would have to be the Anna dress for me. I’ve seen some fantastic variations on blogs and PR and what is great is that this is a pattern which can suit even me – a tall, pear shaped, aging and overweight woman, who actually doesn’t feel at all like that inside! The youngest of my 3 daughters would suit the Elisalex as she is tall and slim – but I’ve sewn 2 dresses for her already and would like to sew one for me now! Even though I haven’t been sewing long, I have built up quite a stash and think I have the perfect fabric for my first Anna. To be perfectly honest, I do not need either dress pattern. That being said, I would love to try out the Anna dress. Having seen so many absolutely lovely versions around the web, I have wanted to own the pattern for some time now. Thank you for offering this opportunity to win these patterns, and good luck to everyone! I haven’t had a lovely chance to try Any patterns from By Hand London. With intrepid jealousy have I watched as all my sewing pals whip up an Anna or hacked the Elisalex into a new dress pattern altogether. I have been admiring them for so long I absolutely need to try them! I don’t know if I prefer one more than the other. The Anna looks the most flattering with a va-va-va-voom slit up the thigh! My reason for wanting a new dress pattern is kinda simple. While I have been sewing for years, I took a break and had a baby and then post partum and then motherhood and no career and such lead me down a path of worn out tshirts, ill fitting jeans, sad yoga pants and gigantic cheap Old Navy and Target clothes. I re-started this fall with a new endeavor to dress fashionable, in well made classy attire, to boost my lacking confidence in my new post-baby body. Just because I am a work from home mom doesn’t mean I can’t look awesome! So help a girl look her best, since I can financially afford these patterns, they would take me a long way to showing myself and the world what I can do. Ps: also showing up all the other fancy parents wouldn’t be bad either! Ha! Previous Previous post: Black & White and spotted all over! Next Next post: Sewing Cake – or something you want, but don’t need.